With the debut of the new iPhone 6 line in September, we expected to see a big boost to smartphone sales globally. The smartphone market is fairly mature, but shipments are still rising by impressive rates — up 28% globally year-over-year in the third quarter, according to BI Intelligence estimates. gleaned some important takeaways about how demand is shaping up among our readers. These respondents skew tech savvy and high income. While they don’t represent the full potential for sales, they dictate competition among high-end smartphone vendors and drive smartphone engagement. In a new report from BI Intelligence, we look at which phones these consumers currently use, how often they upgrade their devices, and which brands and handsets they are most interested in purchasing next. We compare the audiences for the two largest platforms worldwide, iOS and Android, based on income and region. Smartphone brand preference tilts toward Apple devices among our respondents. About 52% of respondents say they own one of the iPhone models. Apple ownership is even higher among US respondents, at about 57%. Already 12% of respondents own one of the new iPhone 6 or 6 Plus handsets. These models had only been on the market for three weeks when we finished our survey at the end of October. 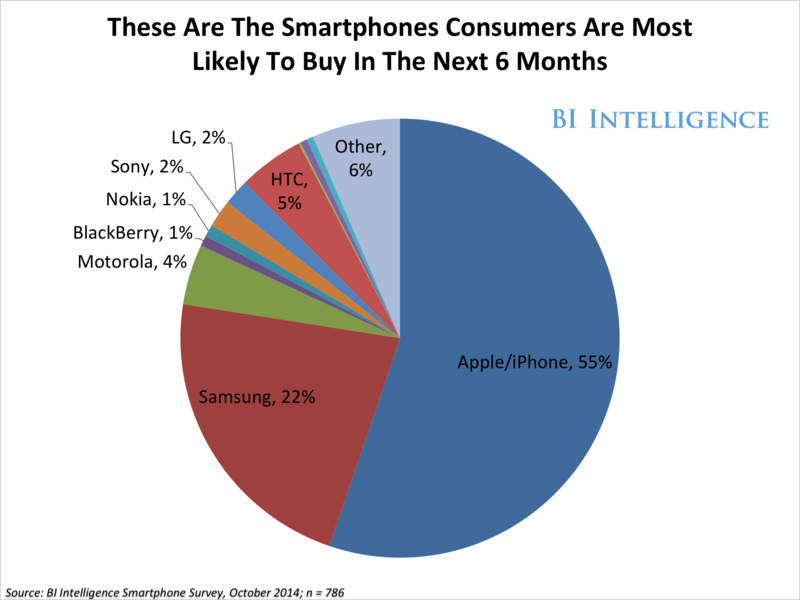 Almost half of the total respondents plan to buy a phone in the next six months, and a majority of them, 55%, plan to buy an iPhone. In second place behind Apple is Samsung, garnering about a 22% share of purchase intent. The iPhone 6 Plus is already seeing fast adoption. Of the future iPhone buyers, one-third said they would buy the super-sized iPhone 6 Plus. The larger screen size was the big selling point. Platform lock-in and loyalty is very high: Nine out of 10 consumers say they want to stay on their current mobile platforms, whether that’s Android or iOS. Only about 8% of respondents planning to buy a new phone in the next six months say they plan on switching from one major mobile platform to the other. To access all BI Intelligence’s downloadable charts, daily briefs, and reports on the mobile industry, sign up for a trial membership.